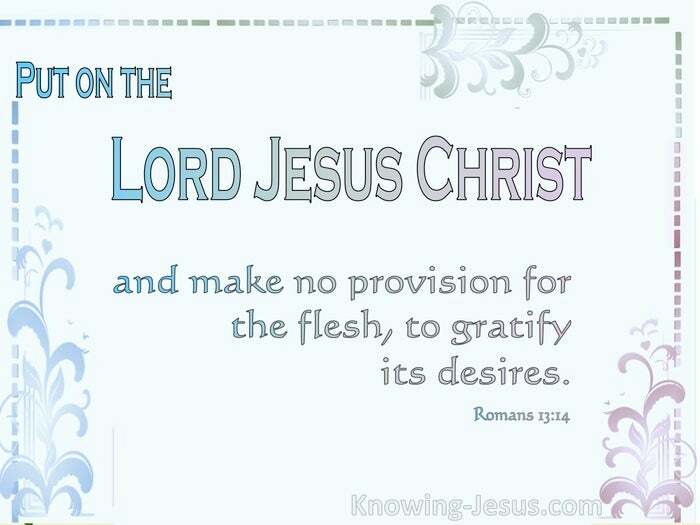 Put on the Lord Jesus Christ, and make no provision for the flesh, to gratify its desires. Christ’s work on the cross and His glorious resurrection – gave us eternal life. His work made all believers complete in Christ and accepted in the Beloved. 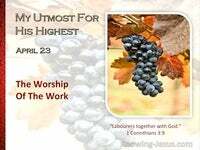 His work caused us to be blessed of the Father and seated with Him in heavenly places. Eternal life is a non-returnable gift given to those who believe – it’s already done. Eternal life is a triumphant, imperishable, enduring life – given to all who believe. So why is this victorious, incorruptible life not the experience of all Christians? 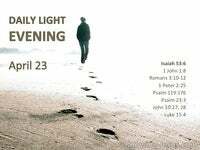 Why do some live a defeated life – for so much of their Christian walk? Well – the simple truth is that many have not appropriated what is already theirs. 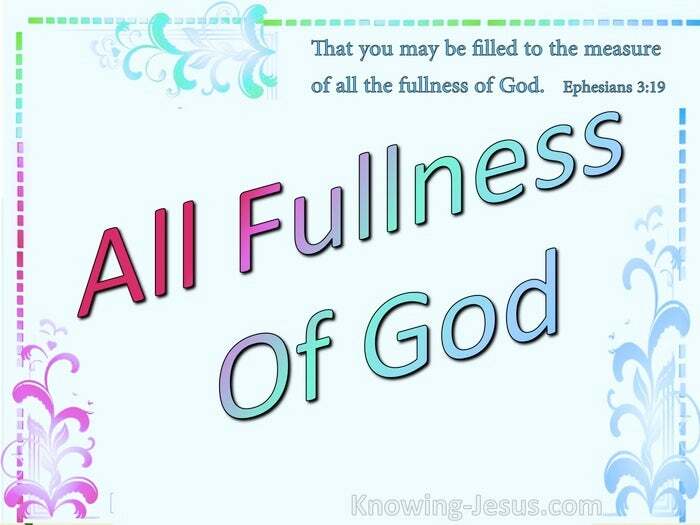 They have not put on the new self – created in the likeness of God’s righteousness. 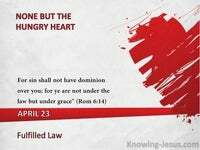 They have failed to put on the Lord Jesus and are working in the power of the flesh – they have failed to appropriate all the riches of God’s grace bestowed upon them. 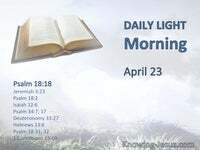 The indwelling Spirit was given as a deposit – that we can live godly in Christ Jesus.. a deposit is given when we are born again as God’s assurance that eternal life is ours. All believers received this down-payment at rebirth – but many just do not access it. The believer can choose to accept and use this deposited ‘given life’ – or not. Not to appropriate this life is like having a full fridge of food – but going hungry – it is like having a reservoir of sparkling water – yet gasping for a glass of water. The believer has to appropriate and use this ‘given life’ – in his earthly walk. He must appropriate this triumphant, imperishable enduring life – BY FAITH. One Christian writer put it this way:- As the result of Christ’s work of His cross, and as the grand issue of His resurrection, eternal life is received already by those who believe. But while that life is itself victorious, incorruptible, indestructible – the believer has to come by faith to prove it, to live by it, to learn its laws, to be conformed to it. There is a deposit in the believer, which in itself needs no addition……so far as its quality is concerned. So far as its victory, its power, its glory, its potentialities are concerned – nothing can be added. But through the course of spiritual experience, (of spiritual life), the believer is to discover, to appropriate, and to live by all that the life represents and means. Money deposited in the bank has little value – unless that money is put to use. The full triumphant, imperishable enduring LIFE is ours – but needs to be put to use. 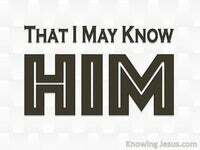 These glorious scriptures tell us all we need to know about what we are in Christ. It’s nice to read them : think about them : admire them ; thank God for them.. but unless we appropriate them they remain deposited within us – yet unused… They must be appropriated to work effectively in our everyday life – and this is done in the same way that we were saved – by FAITH. In his Green Letters Miles Stanford explains “appropriating” like this: How often we simply admire and talk about the truths the Holy Spirit reveals to us in His Word, whereas His primary purpose in giving them to us is that we might stand upon them in faith, waiting confidently for Him to make them an integral part of our life. By faith we stand and seize hold of them. By faith we start to appropriate them. It is by faith that we grow in them and it is by faith that we walk in them – until thru simple trust these scriptural truths become inherent in our life in Him. But it takes time to prove it, to live by it, to learn its laws, to be conformed to it. It just takes time…. Stanford’s concluding comments puts appropriating scripture truth into perspective: He writes: A disciple is one who has a history, He is one who has been dealt with by God. He is one who has experienced the formative work of the Spirit. We are sometimes asked by would-be preachers how many days should be spent in preparation of a sermon. The answer is: At least ten years, and probably nearer twenty! For the preacher matters to God at least as much as the thing preached. God chooses those in whom He has already worked..